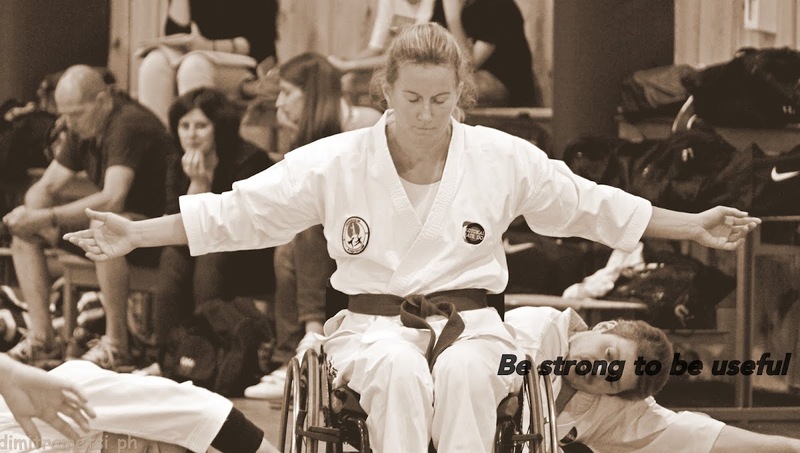 In September 2012 Trondheim Karateklubb held a course for wheelchair users - Introduction to self defense. Eight weeks of fun! In February 2013 the club opened up for training karate for a group of wheelchair users. After one semester we started to train with the rest of the members, not as a separate group but as regular member, training with people with the same colour on the belt, independent if you did walk or sat in a wheelchair. Some adjustment needed to be done, after all as a wheelchair user you do not kick very well. but in all I felt as an equal to the rest of the members. Finally I did training because I found it fun, not because I needed to! I actually looked forward to train. In the years from then until now I have had a lot of fun, great training and gained a lot of new friends! 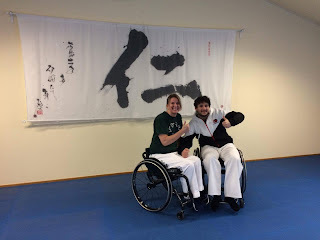 I have also had some struggles with my body, and some days have been really bad, but in February and March 2017 I spend some weeks with my master in Makotokai Wheelchair System at Jin Dojo in Padua, Italy. 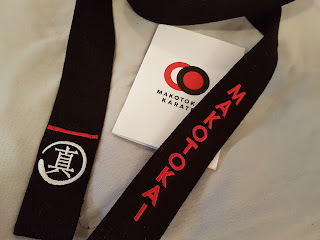 In that short periode of time I felt how martial art made my body and mind stronger, and even my friends and coworkers saw the difference in my body. My posture was straight and proud, I had gained a lot of strength in my core and my chest was more open and I felt I breathed better. I even could contract some muscles in my abdominal that I did not knew I had contact with! Sadly it did not last for long, as I went back to work and did less training again. Many of you know the daily life catch up with you, and the time passes with the things you need to do, and suddenly you no longer priority what is good for your body. I just lacked enough energy to do everything I wanted to do, and of course needed to do, for my body. I went through my exams for 1st dan in Makotokai Wheelchair System in July 2017, with inflammation in both of my arms and not enough training, but my will and spirit kept me going, and I finally got to be a black belt! I am so proud of my achievement! Of course, I could not have done this without my masters and friends, after all they are the ones giving me the spirit to do my best! I am humble to get to be a black belt, and now I feel like I really want to give back to others all I have gained. An idea of a project came in my head. 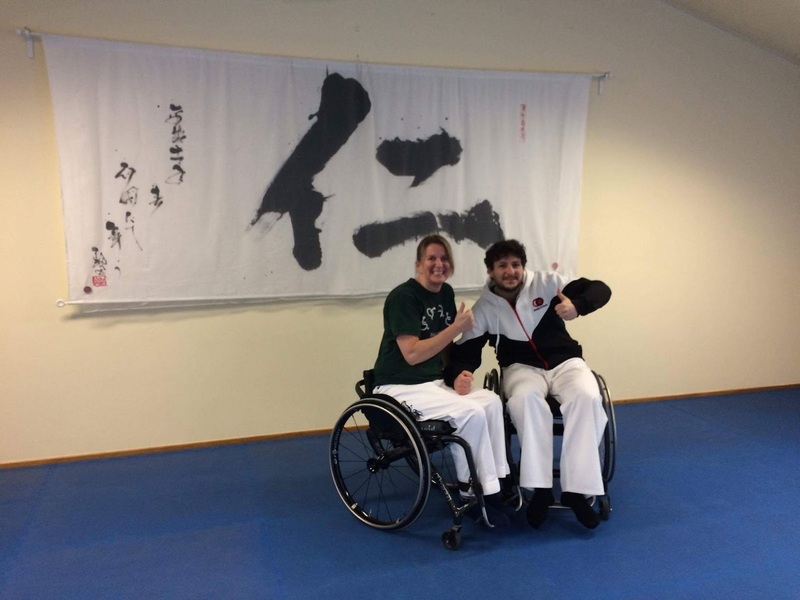 I got funding and permission to leave my work for a year for leading a project to recruit wheelchair users into martial arts together with my dojo and The Norwegian Martial Federation. I want that other wheelchair users also can see and feel all the benefits of doing martial art. I want to give them the same opportunity as I got. My team of great martial artist will make it happen thru the same start as I got - an introduction course in self defense. This project is a Norwegian project called #hjulbeintkampsport and you can follow us in Facebook - Wheelchair Self Defense. 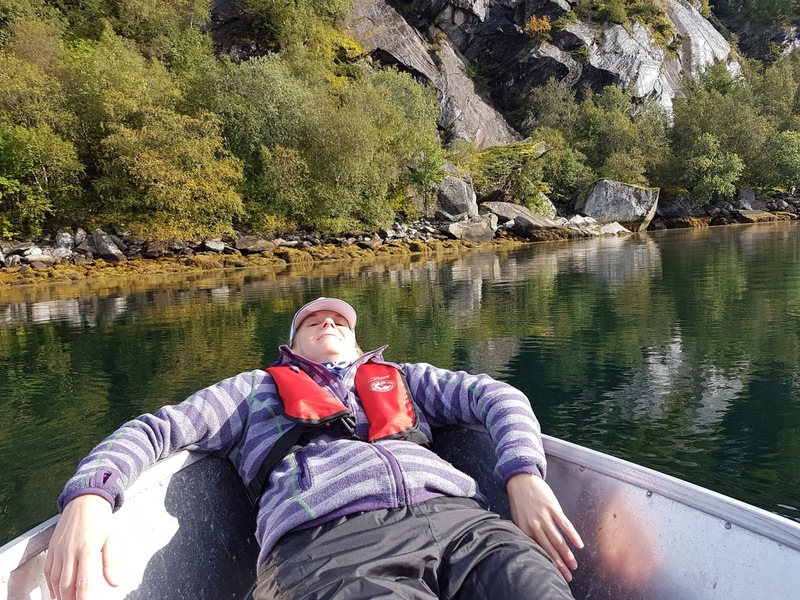 What have a Norwegian project to do with a year in Italy, you may think? Nothing! Or everything! Without my masters in Italy I would not have come this far, I would not have had the spirit to give back, and I would for sure not be able to feel like an equal as a human. 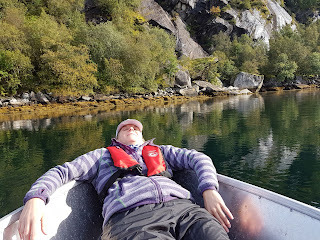 For sure, I could do this project staying in Norway, but to be near my masters, train in their dojos, follow their courses I know I will get to be stronger and my mind will be more focused. And you know, Italy is a bit nicer for a wheelchair user in the winter than Norway is! So, in a few weeks I will drive to my new home in Porto San Rocco in Muggia, Italy, and I will train martial art while I am leading a project, eating fantastic Italian food and enjoy my time in a wonderful country - my second home. I appreciate if you will follow my adventure!